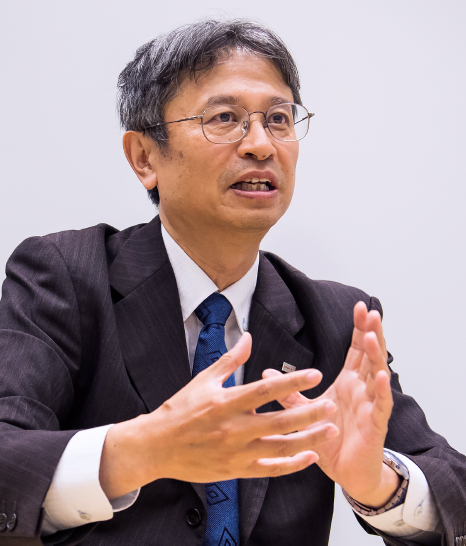 Toshiba Group is transforming itself into a service company, and is accelerating its shift from a conventional relationship with customers to a deeper relationship of co-creation. This change is symbolized in Toshiba Digital & Consulting, a new company established by Toshiba Digital Solutions. It is a team of diverse personnel with specialized expertise, such as business developers, business consultants, designers, data scientists, and solution architects. It provides from consulting to solution services consistently, toward the co-creation of new values based on Toshiba's SPINEX IoT architecture, in order to realize digital transformation (DX). One of the features of its approach is its creation of a new business model together with customers, going beyond the conventional borders of consulting firms and system integrators as it works to produce outcomes through DX. The followings are Toshiba Digital & Consulting's missions and its innovative result appeal/value co-creation-based services. Toshiba has many years of experience with remote monitoring of industrial equipment and social infrastructure systems, and has worked to create new services while engaging in advanced technical development such as the Internet of Things (IoT) and artificial intelligence (AI). In order to contribute to greater customer competitiveness, Toshiba Digital Solutions has been a driving force behind the creation of effective systems that leverage the IoT. SPINEX, Toshiba's IoT architecture, has drawn a great deal of attention for its use in organization reforms and various other initiatives. It draws together advanced digital technologies such as the IoT and AI and the extensive technical expertise and wisdom developed by Toshiba in a wide range of business sites. SPINEX connects diverse products and services, optimizes product lifecycles and value chains, and accelerates DX in various fields, such as manufacturing, energy, and social infrastructure. 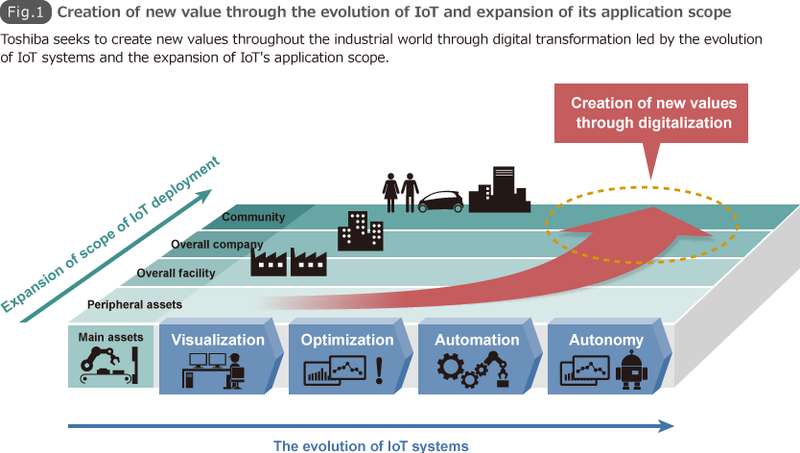 Based on Toshiba's envisaged IoT evolution scenarios, the status of "things" such as devices and machines, and data from related operations are analyzed, and the findings are used to optimize operations and maintenance, implement automation, and realize autonomy. At the same time, we are broadening the scope of IoT from work site assets such as devices and equipment to encompass entire facilities, companies, and communities. Through this, we will play an even more important role as a company that uses DX to create new value throughout the industrial world (Fig. 1). However, no matter how advanced technologies or how solid platforms may be, achieving outcomes using DX is no simple matter. The more you attempt to innovate, the more you encounter needs for completely new things and services, but unless you have a deep understanding of customers, have built relationships of trust with them, and are deeply involved in their business, it is difficult to identify the issues involved and to develop approaches for solving them. Furthermore, to determine if DX has produced outcomes, you need not only to confirm if the problems customers faced have been solved, but at the same time clarifying whether this was due to the solutions you provided. Creating a new system and framework for accomplishing this has been a major challenge for Toshiba. Toshiba has been involved in a great deal of general systems integration (SI), developing systems based on customer requirements. However, there have been few cases in which our involvement were extended to the analysis and effective utilization of the massive amounts of data steadily generated, day-by-day, after systems were put into operation. If we had access to such raw data, a source from which we could create new values, we would be able to make continuous improvements and maximize the potential of SPINEX. We began a quest to develop an optimal system for achieving this. Toshiba Digital & Consulting was launched in April 2018 to take on this challenge. We are on the front lines of Toshiba's IoT/AI strategy, creating new values using DX. We handle everything from business value creation to its confirmation, driven by SPINEX-based consulting by diverse, high-level specialists. In our service model, issues and visions are shared with customers across the boundaries of companies, and we effectively use customer data whose usage value was previously seldom understood. Our greatest features are our commitment to the benefits of the introduction of our services and our showcasing of the comprehensive outcomes. For example, in conventional consulting, plans and strategies based on methodologies and past examples are provided, and often end up as mere wishful thinking. Digital technologies change at breakneck speeds, so it is essential to select digital technologies appropriately, with an eye towards their operations, and to leverage the right resources in the right places based on customer issues and business fields. Outsourcing consulting and system integrations /operations separately makes it difficult to maintain the quality of solutions and services, to continuously produce outcomes while implementing the PDCA* cycle, and to contribute to customer business expansion and improvement. 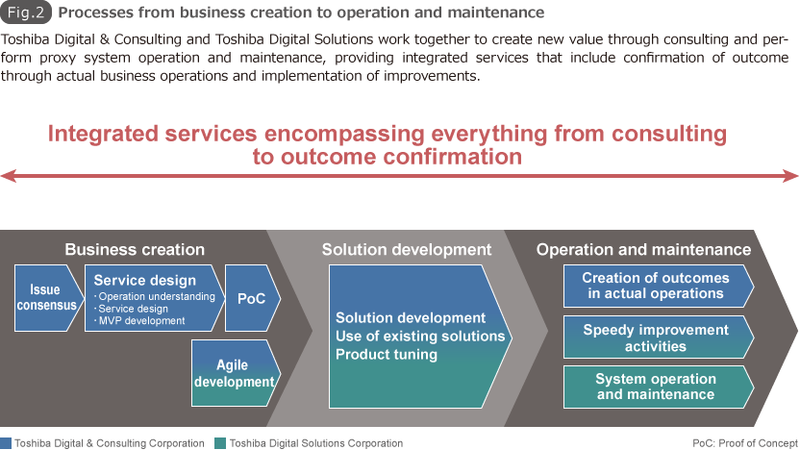 Toshiba Digital & Consulting, together with Toshiba Digital Solutions, provides integrated services that encompass everything from business creation processes to solution development and operation and maintenance processes. It creates teams of diverse visionary specialists, such as business consultants with exceptional logical reasoning abilities, designers able to produce experiential value findings through observation and insight, data scientists skilled in data analysis and service model design, solution architects attuned to technical changes, business developers with expertise in industry trends and adept at pinpointing and crystallizing issues, and domain experts well-versed in the conditions in their fields. They use their many years of experience in business activities and technical development to fuse consulting and SI, swiftly creating new values together with customers. What will be provided for business creation and operation and maintenance processes? Toshiba Digital & Consulting works closely with customers, and is thinking, creating and steadily and consistently producing effects based on global trends, industry movements and its past experience and know-how. Fig. 2 shows our innovative processes, which encompass everything from business creation to operation and maintenance processes. Business creation processes are the processes before the defining of specific system requirements – that is, they are the processes of identifying issues, formulating service frameworks, and creating business plans. These processes are often handled by customers themselves, due to their in-depth knowledge of operations. Toshiba Digital & Consulting adds its own perspectives, based on the experience in various business fields and its broad-ranging digital technology expertise. In order to create solutions that provide outcomes to customers, it is important to formulate highly effective frameworks that combine all perspectives, such as management, field, operations and technologies. First, business developers take the lead in gaining a deep understanding of customer’s business. They reach a consensus with executives regarding customer issues, sharing the latent issues in each of the customer's business fields, the seeds of their future growth, their respective priorities, their vision, their targets, and the like, and plan start-ups together with customers. Specialists in individual industries, management, and technologies assess customer operations, and, based on their assessments, become deeply involved in service design by exploring future potential based on technology and market trends. Producers, domain experts, business consultants, designers, and data scientists balance what they bring to the table to create effective proposals. They then work with solution architects to formulate requirement definitions from both operation and system perspectives. In this way, they evaluate and select technologies and products from a neutral standpoint, and develop minimum viable products (MVP) using agile development methodologies. Through executing proofs of concept (PoCs), they prevent reworking and the gaps from the actual needs during the phases of system design and solution development, and lead to smooth creation of solutions. Operation and maintenance processes are the operation processes after solutions have been introduced. They are important processes for determining if customers' issues have been solved and for developing further improvements. Customers can entrust us with the system operation and maintenance work that they had previously performed themselves. We boldly take on actual field operations, which are avoided in conventional SI approaches. We also use Toshiba's RECAIUS communication AI and SATLYS analytics AI technologies for sophisticated analysis of the tremendous amounts of data that are constantly being generated. We carry out speedy improvements based on accurate measurement of outcomes and use SPINEX to its full potential to refine solutions, in order to make them even more effective. In addition to its Digital Consulting Division, led by business consultants and digital personnel that span business fields, Toshiba Digital & Consulting also has four divisions that specialize in the railway, logistics and distribution, energy, and social infrastructure fields. We have developed approaches through our experience of manufacturing in a diverse business sites, expertise through our work on the frontlines of IoT and AI technology, and speedy response through our integrated, close-knit services. We combine these approaches, expertise, and speed to co-create new value along with customers in numerous industries that support society. Toshiba Digital & Consulting will continue to forge society's future together with our customers. * The corporate names, organization names, job titles and other names and titles appearing in this article are those as of July 2018.